We already learned that it required both IP Addresses and Port Numbers in order that two computers could communicated with each others. 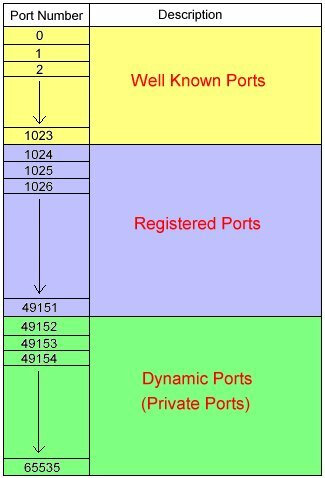 Let’s see how port numbers are assigned to a computer. Most well known services (e.g. HTTP, FTP, Telnet, SMTP, etc..) are running in this range. These ports are tightly bound to services. Usually traffic on this port clearly indicates the protocol for that service. For example, port 80 virtually always indicates HTTP traffic. These are loosely bound to services, which means that while there are numerous services “bound” to these ports. In theory, no service should be assigned to these ports. Tomorrow I will discuss some of the services used in the Well Known Ports.